Individual directors may wish to voluntarily terminate their own appointments for any number of reasons, both personal and business. They will normally do this via a formal resignation from office. It is important that the director’s intention to resign is communicated to the company unambiguously and in accordance with any procedural rules that the company has identified as being necessary for this purpose. If it is not done properly then the company may be able to refuse to recognise the notice of resignation and, in the meantime, the director might have to continue to assume partial responsibility for the actions of the board. • notice will be deemed to have been given 48 hours after it was posted. 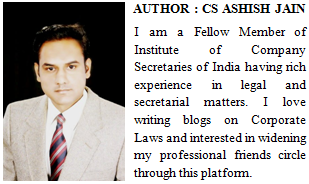 Accordingly, where a company has adopted articles of association that mirror the above provisions of Table A, a director wishing to resign should ensure that these core criteria are complied with. A notice of resignation will be treated as effective if it is given to the company secretary. (Note that under section 270 CA 2006 – which takes effect in April 2008 – private companies are not obliged to have a company secretary: in this situation, it will be convenient to send the notice of resignation either to the chair or to each of the directors.) Even where the articles require notice to be given in writing, however, if a notice of resignation is made orally and is accepted there and then by the other directors present, the notice will be effective and the resignation may be definitively recorded by the company (Latchford Premier Cinema Ltd v Ennion  2 Ch 409). The provisions in Table A as to proof of posting provide comfort for a director where he or she decides to send the notice of resignation through the post as opposed to presenting it in person to the company secretary or chairman. Where a director decides to use this method, it is a sensible precaution to make a copy of the notice and to secure and retain proof of posting: article 115 of Table A will thereafter ensure that the notice is deemed to be validly given even if the notice never actually arrives or the company claims that it has not received it. Individual companies may have articles which diverge from the standard requirements of Table A or go further than them. For example, it may be the case that a set of articles will provide that a resignation is not effective until it is has been approved or recorded by the board. Thus, directors should ensure that they are familiar with any special provisions of their companies’ articles with regard to resignation procedures. The draft 2007 model articles, for both private and public companies, contain fewer formal requirements for the process of resignation. They say only that the director will cease to hold office ‘as soon as a notification to the company that [he or she] is resigning or retiring from office takes effect in accordance with its terms.’ This suggests that the resigning director can specify the date on which his or her resignation will take effect and that this will be conclusive in determining the effective date. 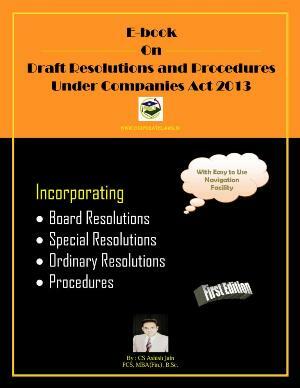 The draft articles go on to provide that, in respect of all notices and communications between directors and their company, they may be sent by any means authorised under Schedule 4 of the Companies Act 2006 itself – this will expressly legitimise electronic as well as hard copy means of communication for this purpose. (Note that, to be valid, electronic communications to the company must be sent to the address specified by the company for the purpose of the communication). The draft 2007 articles also provide that individual directors may agree with their company that notices may be deemed to have arrived within a specified time of their being sent. In CMS Dolphin Ltd v Simonet  BCC 600, it was held that a director’s decision as to whether or not to resign was not subject to any fiduciary duty – he was entitled to resign even if his resignation might have a disastrous effect on the business or reputation of the company. But, as is discussed later in paragraph 10.44 et seq, a director should consider carefully any decision as to whether to resign if the company is in financial difficulties and there is a strong possibility that insolvent liquidation will result. The wrongful trading provisions of section 214 IA 86 mean that, where a company’s directors know or ought to conclude that their company cannot avoid insolvent liquidation, they will be at risk of being made personally liable for the debts that their company continues to run up unless they can show that they took ‘every step’ to minimise losses to creditors. Exposure to liability under these rules is not avoided by the simple expedient of resignation – a court can impose liability on any person who has been a director of the company in the two-year period leading up to liquidation. Accordingly, resignation in such circumstances could mean that a director who leaves, as opposed to staying on to try to arrange a proper resolution of the company’s affairs, may be more – rather than less – likely to fall foul of the provisions of section 214. 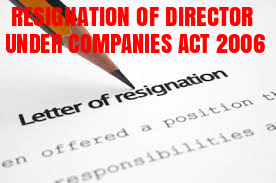 When a director resigns from a company it is the responsibility of the company, under section 167 CA 2006, to file a notice of that fact with Companies House. The notice is given on a prescribed statutory form, and is – on receipt – added to the company’s file on the Companies House database and made available for public inspection. The purpose of the filing of this form is solely to enable the details of the company’s officers on the public record to be kept up-to-date and is unconnected with any question of the validity of the director’s resignation. Where a company fails to give proper notice of a director’s resignation, this may give rise to legitimate concern on the part of the resigned director as to his or her continuing responsibility for the company’s affairs. The Act contains power for new measures to be introduced, via regulations, which will improve the rights of persons to insist that inaccurate information on a company’s public file is rectified: this power may conceivably be used to ensure that resignations are properly recorded. While this would provide some additional comfort, the non-deposit of a notice of resignation does not mean that a director who has validly resigned in accordance with the constitutional provisions of his or her company is still a director for legal purposes.